Yesterday, Jason spent the entire day mixing cement and framing out our new and improved front porch. When he wrapped up at 6:30, the homemade meal we had planned seemed impossible. At first we thought, “Let’s just do Alor,” our go to, easy, always delicious backup plan. But we had just been there on Thursday, and I was in the mood for something different. I had heard of Cucina Fresca from a few different people. It’s a tiny place, actually on the same strip as Alor Cafe. For a Saturday night at 7:00 we weren’t sure we’d be able to get a table, so we figured we’d check it out and if it didn’t work we’d head to the trusty Alor. I checked out reviews for Cucina Fresca on Yelp and basically got a mixed bag: most said the food was good, but there were a handful of complaints about service and attitude problems. On the drive over I decided to give them a call to confirm that they were BYOB – one of the Yelp reviews had mentioned it, so I had grabbed a bottle of wine, but wanted to be sure. During a rushed and kind of awkward conversation, a woman (who I later learned was Jill, an owner) confirmed that they are BYOB, but did not have any tables open until 9:00. It looked like an Alor night, after all. Jason and I left the bottle of wine in the car, and decided to just stop into Cucina Fresca to check out the space and their menu to see if we would even want to come back. We were greeted warmly by a waiter (I think his name was Mike, but could be messing that up) who gave us a take out menu, and explained the specials. We were ready to leave when the same woman I’d spoken to on the phone, Jill, grabbed us, saying that a table had finished up early and they would be able to squeeze us in. So Jason ran back to the car for the wine, and we were seated. This was a complicated start, but it turned out to be a pretty good meal. The place is interesting: it’s tiny with only about seven or eight tables. Instead of having one person helping us throughout the meal, we were served by a rotation of the husband and wife owners, and Mike, another waiter. It sounds confusing and like it would be a messy service, but it somehow worked well: a very warm and family-esque vibe in the little place. 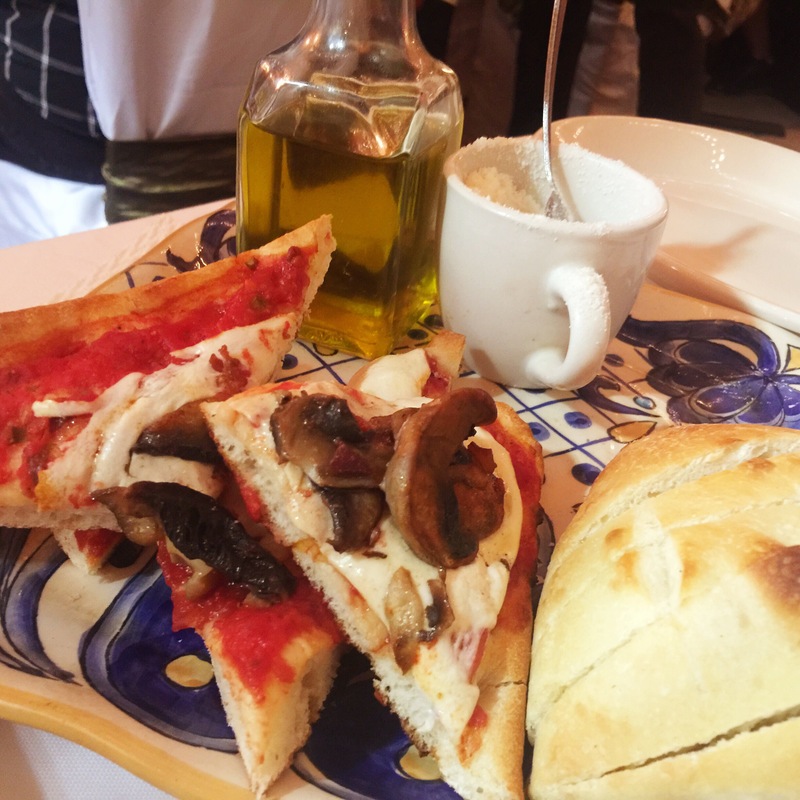 To start, we were brought an extremely generous assortment of complimentary items: first was pizza bread with mushrooms and a warm sliced roll with cheese and olive oil. 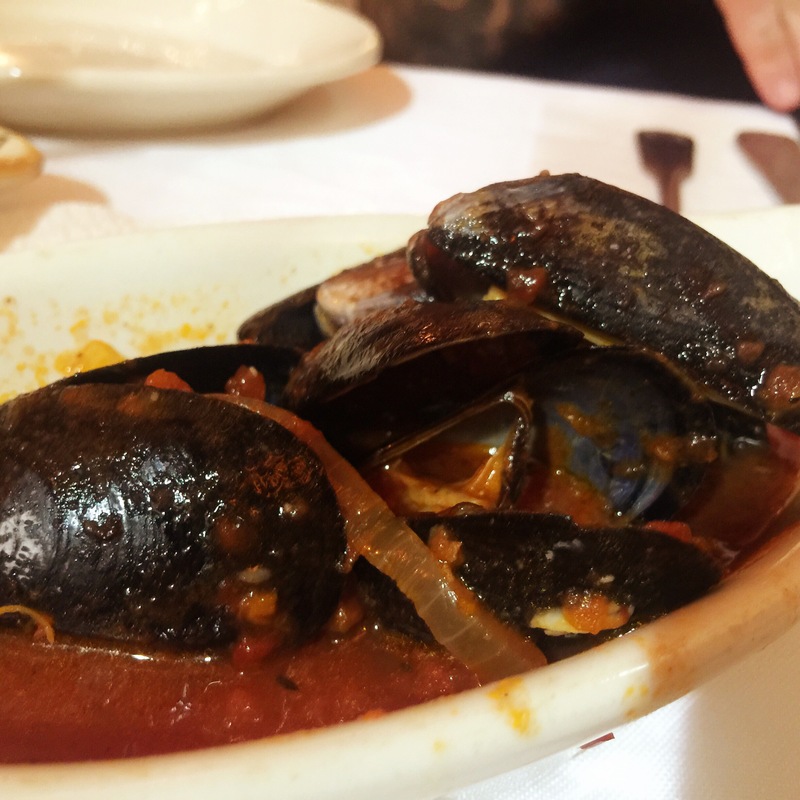 Next was a plate of about seven or eight mussels in a mildly spicy marinara sauce. After that (not pictured) was a slice of pork tenderloin, rolled out on a cart and cut table side, and dipped in a sweet brown buttery jus that was delicious. We were already feeling pretty good about the food before we had to order anything. The menu was full of all of the very typical Staten Island Italian dishes: chicken parmigiana, pastas galore, chicken francaise, veal marsala, etc. In addition to the standard menu items was a moderate sized list of specials, written on a chalk board, which apparently changes weekly based on what’s available seasonally. These items were much more interesting to us, including Chilean sea bass, lamb chops, pasta specials, frutti di mare, filet mignon (cut to order), and burrata. 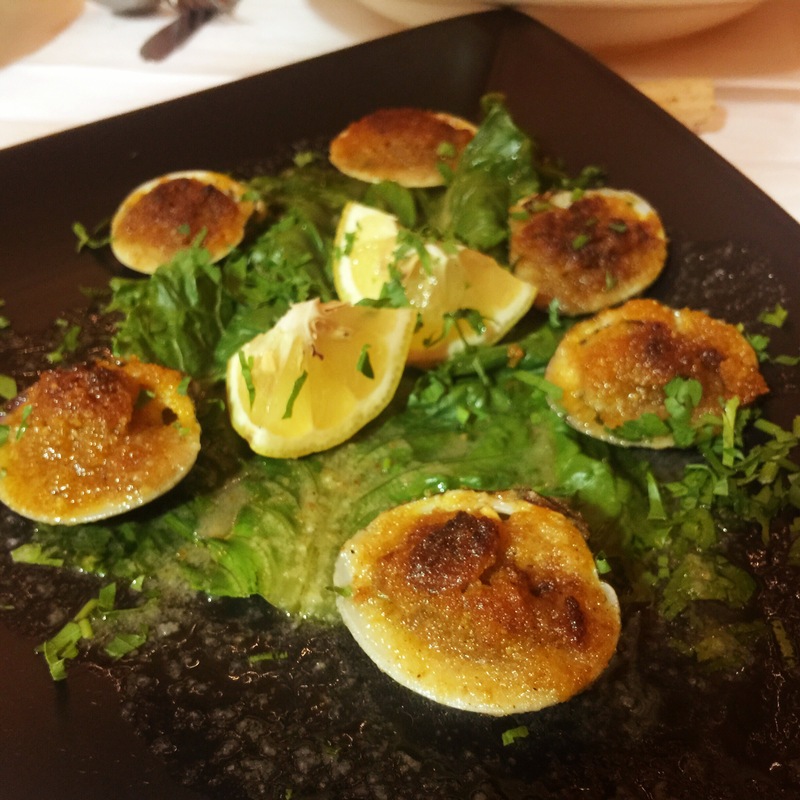 We decided to start out with a half dozen baked clams, something that basically every single Italian place in Staten Island has on their menu. These happened to be some of the best we’ve ever had. The breadcrumbs were perfectly seasoned, buttery, and the clam itself was just barely cooked, so you could still taste the freshness of it. They were cooked well, with the breadcrumbs perfectly crispy on top, and soft on the inside. Next we did our standard Caesar salad and this, unfortunately, did not go as well as the clams. 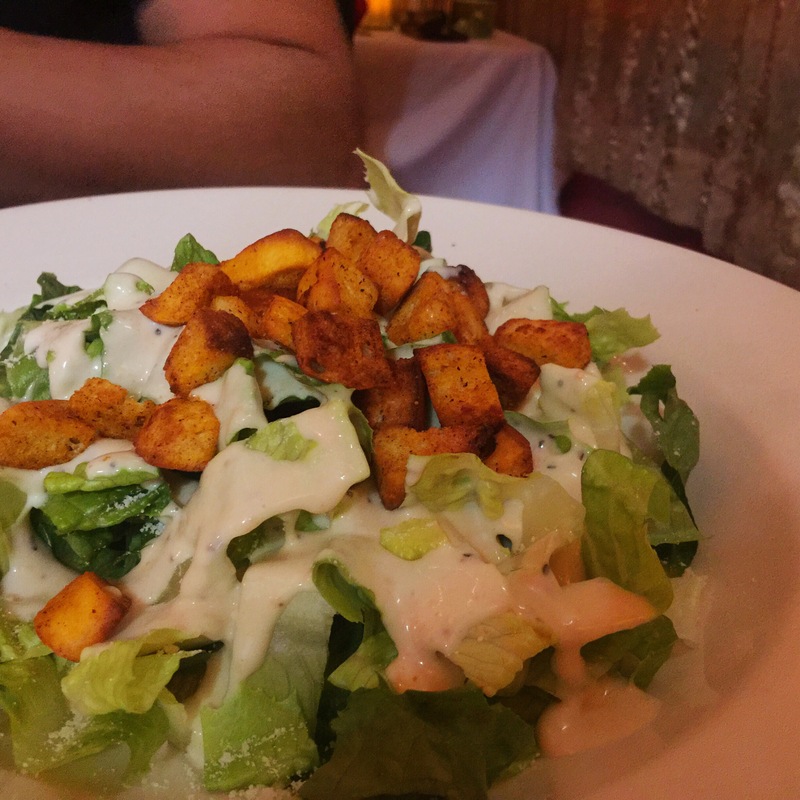 It seemed like a haphazard item on their menu – something they felt like they needed to offer, but didn’t put any time or care into. The signature anchovy flavor of a Caesar salad was nowhere to be found, and the dressing was a sloppily glopped on bottled version. Salad dressings, in my opinion, should always be house made, as they’re pretty simple and can be made in bulk and stored for a few days at a time. Greens should be tossed with just a very light coating of dressing, whereas this was extremely heavy and poured all over the top. This dish was a flop. 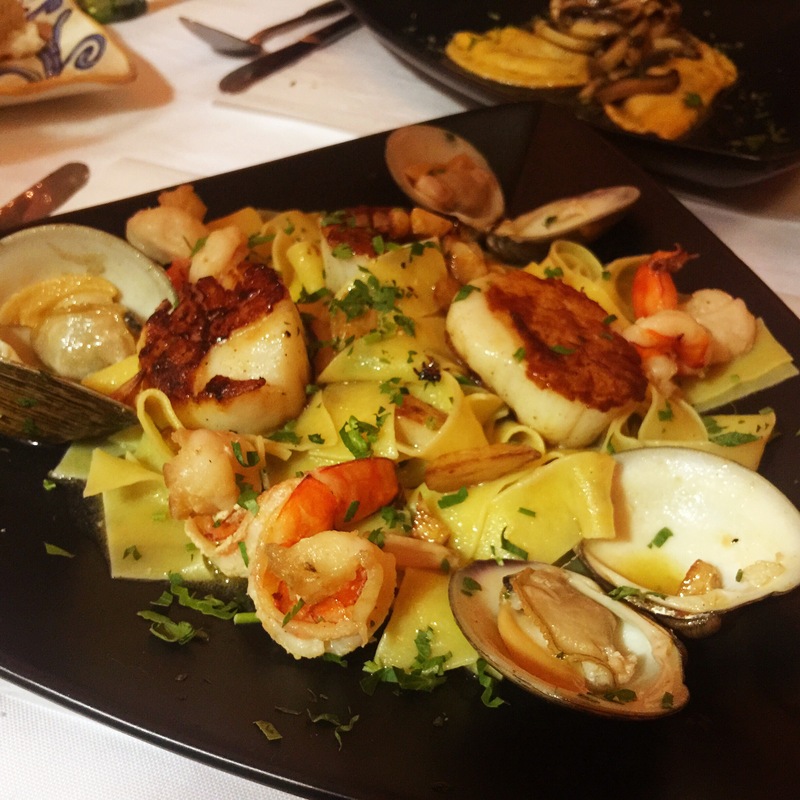 Next we shared two different entrees: mushroom raviolis (from the regular menu) and frutti di mare (from the list of specials). These were both predominantly well done. Both came with a generous and delicious amount of roasted garlic tossed into their light olive oil based sauces. 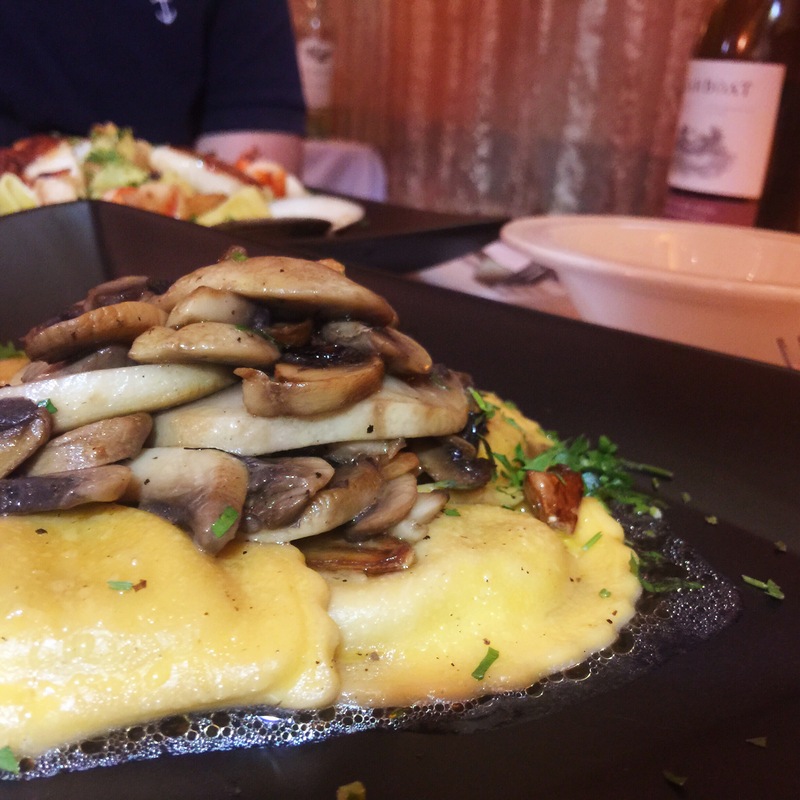 The mushroom raviolis had a great earthy flavor, and were very simple but delicious. The frutti di mare was good, but I found the seafood in this dish inconsistent: the one scallop I chose, clams, and shrimp were overcooked, while the two other scallops were cooked well (that perfect opaque in the very center when you cut in). The pappardelle was good, and I appreciated the time taken to de-shell the shrimp, something I always dread having to do. At first I felt that the pappardelle’s “sauce” (if you could call it sauce, it was more of a dressing) needed some salt or flavor, but after adding some grated cheese, I found it to be just right. These dishes left us satisfied and happy, but we always save room for dessert. Jill recited her dessert menu for us, which had some interesting options including a rustic apple cake and a chocolate trio, among others. 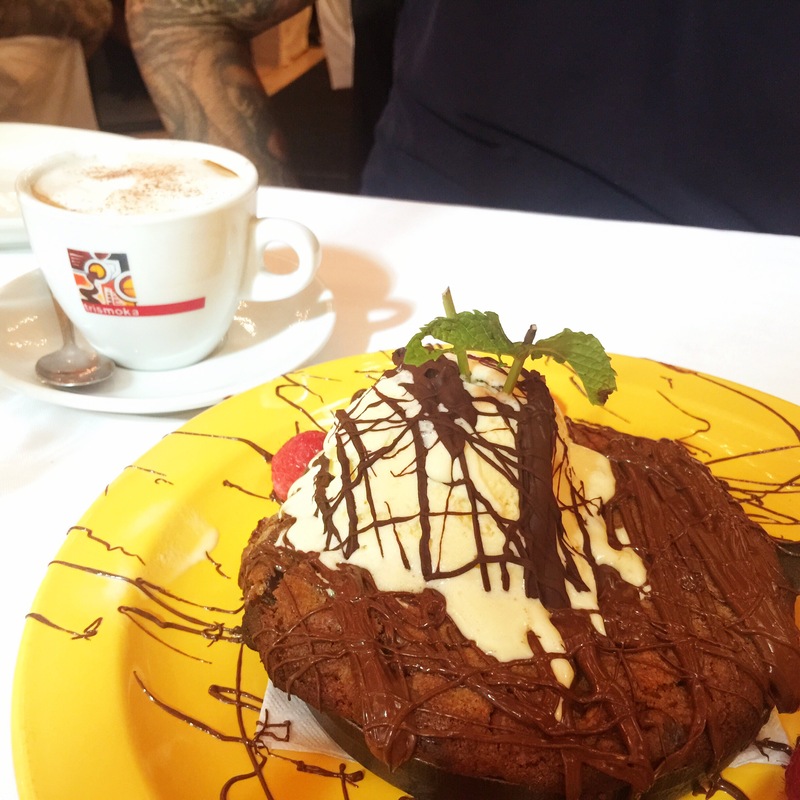 But we had already seen and smelled the chocolate chip skillet cookie from across the restaurant and needed it. This was my favorite part of the meal, and I may be returning embarassingly soon for another. Ok, it’s a chocolate chip cookie, how can it be so special? But it was just so warm, and that perfect amount of undercooked where it’s done, but still gooey and fudgey. I needed the ice cream to cool down each bite so I could eat it without burning my mouth; I simply could not wait to shovel bite after bite into my face. The chocolate ganache on top was great too, just a simple chocolate sauce that had hardened on the ice cream, but remained melty and wonderful on the hot cookie. Overall, I really enjoyed this place. It may not be the eclectic style of food that Jason and I typically go for, but for the Staten Island Italian basics, they were on point. I am confident that their parmigianas, marsalas, lasagnas, calamaris, and other classic dishes are great. This is the kind of place I could take my 90-year-old, Brooklyn born, Italian grandfather to and know he’d feel safe. The Caesar salad and overcooked seafood definitely lost them some points, but the clams and that skillet cookie were awesome. I’m giving Cucina Fresca a solid three star Baconboozer rating, for a guaranteed good Italian meal – I’d go here before the over-hyped (in my opinion at least) LaStrada, Bocelli’s, or Italianissimo any day of the week. I’d like to give a shout out to the team there: I have to say, at first I was a little turned off by the awkwardness of the phone conversation I had… I could see how some people had a first impression of rudeness. But after a meal there, I know that the owners may be a little quirky (and I love quirky), but are anything but rude. The other waiter was so excited about the food and was warm and attentive throughout. The entire staff is professional and did a great job of making this meal feel special, as every meal should.